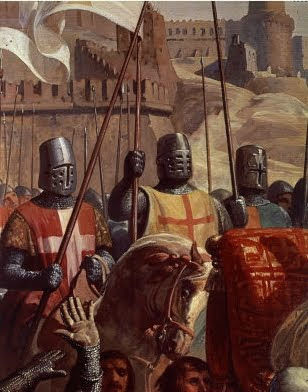 In our world history book, we've been studying knights and the Age of Chivalry. We discussed how boys who were sons of lords were raised to be knights by dividing their lives into three stages. A boy stayed with his mother until he was seven; from seven to fourteen years he served as a page; and from fourteen to twenty-one he served as a squire. 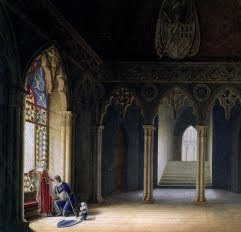 Ideally he was knighted at 21 and would thereafter embark on his adult life in service to his liege lord. But what struck me in this particular book is the description of the boy's page years. "His chief business was to wait on the ladies of the castle," says the book. "He ran their errands, carried their messages, waited on tables, etc. He also learned to ride a horse and to be brave and courteous." I stopped reading at this point and we discussed why a boy would spend so many years specifically waiting on women. Women, I explained, are the civilizing influence on men. If a boy can learn manners, courtesy, and the expected behavior toward women at a time in his life when those expectations would not cause resentment, then he'll have those skills and manners for life. Then he becomes a squire. During this period of his life "he waited on the men, as he had waited on the ladies when he was a page. He attended to the men's horses, went to battle with them, led an extra horse, and carried another spear or lance in case these should be needed." In other words, during his teens years when a boy's body is strengthening and his mind loses interest in the softness of women - in other words, when he is striving to learn what it takes to be a man - then the boy is immersed in the world of men and men's duties. Admiring men as I do, this struck me as a sensible arrangement for its time. It's clear the Medieval mind knew the stages of a boy's life and what it took to raise a chivalrous knight. It's no accident that the legends from this time have come down through the ages with the Court of King Arthur, etc. So the question arises, can we do this today? As the Age of Chivalry passed, society still had to deal with its young men. The answer was to apprentice boys under the tutelage of another man to teach the boys a trade. Obviously history is full of stories of horrible apprenticeships, but the ideal result was the same as that of a squire: just when a boy reaches the age when he needs to get away from the feminizing influence of his mother, he was assigned work duties under a man and began to learn a trade that would harden his muscles and his mind, and allow him the opportunity to be gainfully employed as an adult. We have no sons to raise to knighthood. But we have daughters who will some day marry someone else's sons, so I'm always interested in how people raise their boys. My friend Enola Gay's sons are the perfect laboratory because she and her consort Sir Knight are raising two fine youngsters. She has some excellent thoughts on the subject of raising boys here. "Knighthood" in today's parlance obviously doesn't mean riding around on horses and slaying dragons. Or does it? 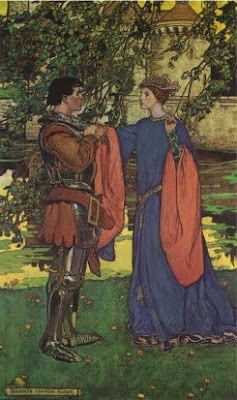 A knight treats women with courtesy and works hard at whatever his duties and tasks are in life. He takes pride in providing for his family, in working hard and honorably, in keeping his word, and in assuming his rightful place as head of his household. 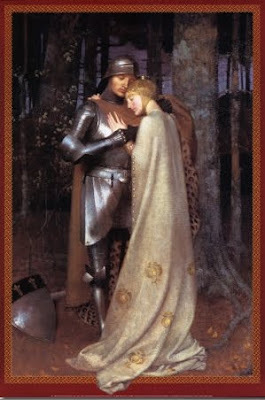 I'm pleased to have married a Knight and so my daughters are growing up with an excellent example of the right kind of man to marry. If it makes you feel any better about our current situation, the high era of chivalry was trying to regain what they felt was missing from their own times. Remember they were idiolizing King Arthur and his Knights. We live closer to the knights time period (Roughly 2011 AD -1300 AD = 711 years versus 1300 - 500= 800 years)then they lived to Arthurs. So the Knights are closer to our contemporaries than Arthur was to them. It was a very brutal time period. Remember that these pages and squires also acted as hostages to the good conduct of the father. Oops, I missed that Painted Moose! Thanks for pointing it out. When my son, who is now 17 years old, was 7, we were at a Scottish Faire and a Lady there gave him a piece of paper to go along with his page's ring. On the paper was this creed. He had this hanging on his wall until we moved into a travel trailer 4 years ago. It will go on his wall again, now that we just moved into our house. In fact, I had to go get it out of it's storage box because it was not yet unpacked. He was also told "thou dost weareth thy kilt upside down" as he was wearing a flannel shirt. We had a good laugh at that one. We have tried to raise him to be a knight of honor and he has committed his life to Christ so he is well on his way. We are raising his sister to be a maiden of virtue as you are with your daughters. We pray for all their futures in this world, but mostly for their futures after this world. Patrice, would you mind sharing the title your world history book? Thanks! I would be interested to know what history curriculum you are using as we are in the market for a new one for next fall. For a 12 year old. I was interested to see the topic of today's post was about the behavior of knights and how to train them. This may be slightly off topic, but here goes. . . I like to watch commercials and see how they relate to our society. This morning I saw a Tide commercial that got me thinking about real Men and their role in these modern times. The commercial shows a man who has been working on the car and he needs something to wipe his dirty hands on and there on the clothes line is his teenage daughter's tiny white skirt. He hesitates then wipes his hands on it. The rest of the commercial is how Mom can use Tide to get out the stain and allow her daughter to wear this micro mini skirt while the Dad sits in the background. It suddenly hit me this morning how this was feminism's effect on the family. Dad can't protect his daughter and stop her from wearing the "come and get me" skirt. And Mom will do all she can to make sure her daughter will be able to attract young men. Dad is isolated and relegated to the background. The family is divided and communication has broken down (Dad can't say he doesn't want the daughter to wear the skirt) and there is no respect shown to each other (otherwise why would Dad have to go to such lengths to keep the daughter from wearing the skirt). This is just one commercial and families are bombarded by dozens of these every night, showing this is the way people should be. And the sad part is no one even notices the way our perceptions of personal relations are affected by these thirty second scenarios. Patrice, I loved the article. Our son looked at it and said of the top illustration, "Whoa! How'd they get a photograph of real knights?!" His eyes were saucers. He's ten. Very interested in art. And likes knight stuff. Sheilab15, I thought your comment was on topic, showing the stark contrast between mainstream society and one that raises knights and maidens of virtue. The world history book we're using at the moment is called "A Child's History of the World" by Virgil M. Hillyer, put out by the Calvert School. It's a reprint of a book that originally came out decades ago. It's a bit young for my kids but a good general overview of world history. When we're finished with it we'll find something that delves a little deeper. Very insightful. My boys are 7. I have that book, although we haven't used it yet. We're using TruthQuest History guides, along with many excellent books, primarily biographies and historical fiction. Amazing how much they learn and retain. Thank you for this excellent post. Good food for thought, and for plans in raising my knights. Well one of the reasons it is hard to find knights in training anymore is a lack of hands. You see one hand is always required to be used to keep his britches low enough to look stupid and high enough to prevent anyone from removing any doubt that he is stupid. Just enough to look like a jail chicken. The other hand is too busy with either a cell phone or video game to be courteous or respectful. Opening a door for a lady is as foreign to these boys as eating whale blubber. You can blame parents only when you have both of them at home, the country is full of one parent families. I can highly recommend a book called, "Raising a Modern-Day Knight: A Father's Role in Guiding His Son to Authentic Manhood," by Robert Lewis. To follow the specific example in the book requires the father to have a very special and dedicated group of friends - unfortunately not something everyone can lay claim to - but the tenets are great and there's much to consider even if you have to take the content and mold it to a different circumstance. A good addition to your bookshelf and a great gift.